DARLING DOWN Release Music Video For "Collide"
Battle Creek, MI hard rock band DARLING DOWN have released the official video for their single, "Collide", featuring a solo by Clint Lowery of SEVENDUST, off of their newest album Never Tell. "Collide" was directed by Travis and Samantha Ross at RipJaw Media. Watch the video on KNAC.COM HERE and click HERE to buy DARLING DOWN Never Tell on ITunes. The band, an outstanding female fronted four piece, has a synergistic effect among its members: Amanda Legault’s clear, strong vocals that range from powerfully compelling to hauntingly sweet, Dustin Claud’s driving and dynamic guitar riffs, Nathan Simmon’s thunderous bass lines, and Ryan Hudson’s tight musicianship on drums. Committed to lyrically thoughtful and melodically engrossing songwriting with powerful hooks, DARLING DOWN is distinctive in today’s musical arena. With lyrically relatable songs full of enough edginess, passion and real life to appeal to a wide audience, DARLING DOWN’s songs are catchy, intriguing, and heavy; beautifully sung, constructed and arranged. Sonically driving, with soaring vocals and harmonies, the deep lyrics are sometimes juxtaposed with eerily strong, pretty vocals and heavy guitars, as on their earlier recording, Revenge Is Sweet Like Cherries. 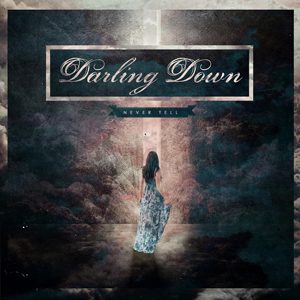 Fast forward to 2014, DARLING DOWN is not holding anything back with their second full length release, Never Tell, produced by the nationally acclaimed producer/engineer/mixer Chuck Alkazian (SOUNDGARDEN, TRUST COMPANY, POP EVIL) and recorded at Pearl Sound Studios. Never Tell, which was released on 7/22/2014, has garnered a sizable amount of industry buzz. A stellar collection of songs, creatively written and with spectacular pieces of orchestration, DARLING DOWN and their producer have created an album full of great musicianship, mesmerizing rhythms and melodies, and exciting, innovative collaborations with accomplished outside artists. Never Tell features guest appearances by Clint Lowery of SEVENDUST, Vinnie Dombrowski of SPONGE, Stephen Richards of TAPROOT, and Brett Hestla of DARK NEW DAY. Ramping up for the expansion of their touring in addition to their current live shows on schedule, following the release of Never Tell, DARLING DOWN continues to increase their live show radius throughout North America. In recent years, DARLING DOWN has developed a loyal fan base with their passionate music and high energy live performances, and grabbed the attention of audiences throughout the Midwest. The band has performed alongside many notable acts including Theory of a Deadman, Nonpoint, Taproot, Smile Empty Soul, Pop Evil, Red, Ra, Framing Hanley, Saving Abel, Evans Blue, Saliva, Hed PE, Mushoomhead, and many more. DARLING DOWN, fresh off the release of Never Tell, will be one to watch as they share their new music and unique show with an even wider scope of music fans throughout the country. Be on the lookout for upcoming tour dates!